Upon our arrival into Cleveland, my wife looked up a tasty restaurant in Lakewood. We zig-zagged our way to Melt, a bar, and grilled cheese joint. After devouring the Cuban War Pig sandwich and finishing a couple of their local beers, I knew this was going to be a great weekend. I grew up traveling to the Midwest as a child, visiting family in Michigan and Wisconsin, but I’d never visited much of Ohio. So, when I got the invite from Mikey Arnold, a.k.a. Mikey Revolt, to have my pictures featured alongside nine other moto photogs in the 2nd Annual Fuel Cleveland show, I jumped at the opportunity. On Friday, my wife and I, along with some friends, saw the number one landmark Cleveland has to offer: The Rock and Roll Hall of Fame. After looking at guitars, clothes, and other memorabilia from the who’s who of rock’n’roll, it was time to eat some perogies and schnitzel before getting an early look at the Fuel Cleveland venue. 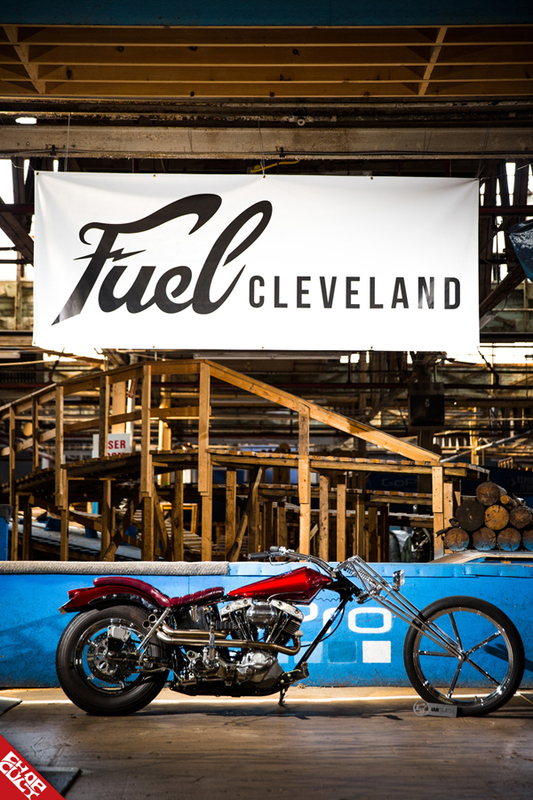 This year, Fuel Cleveland was being held at Ray’s MTB Park, a skate park of sorts made for mountain bikes. 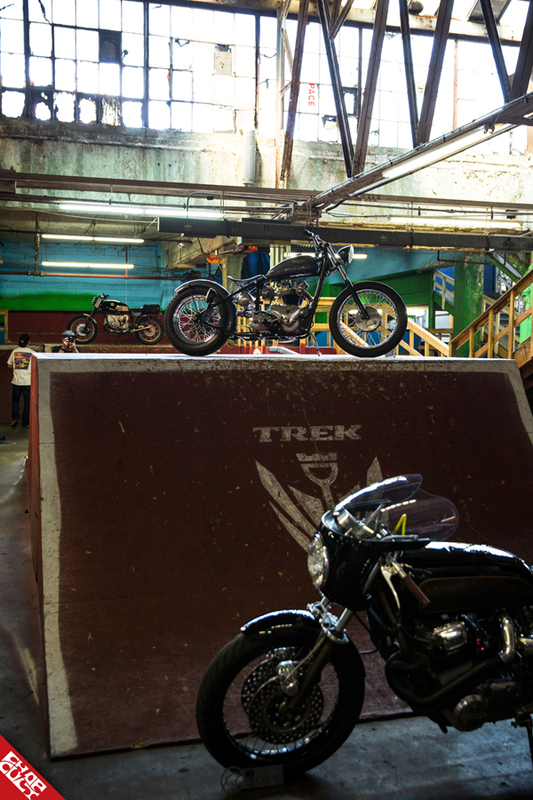 Set in a dilapidated warehouse in an industrial park, the interior is stacked with ramps, planks, wooden berms, and jumps. I arrived at the venue the day before Fuel to shoot the load-in and the bikes. As I walked around the park, I couldn’t help feeling like it was a scavenger hunt. Every corner I turned, there was a new bike set on top of a ramp or in the corner of a bowl. The décor in each room changed too, from outdoor murals to bright colorful splashes. Truly a venue unlike any other I’ve ever seen. That evening was the pre-party, thrown by Biltwell, at a bowling alley in Lakewood. Live music and DJ sets inside, and bikes wrapping around the block outside. Friends, new and old, enjoyed tasty food, drinks and rolling some rocks between the gutters. It was apparent that people from nearly every corner of the country, and even a few foreigners, had made it to town for the next day’s main event. When I arrived at Ray’s on Saturday, the parking lot was already full. There were bikes, vans and old cars around every corner of the industrial park. Inside the venue, more bikes had been moved into position, and the crowd was already thick, as people meandered through the park admiring the motorcycles in the show. 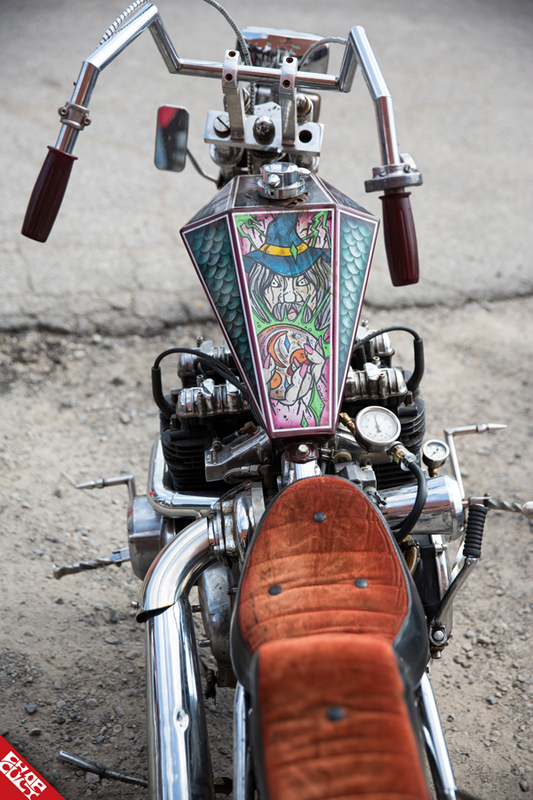 Everything from land speed bikes and vintage cafés to modern and survivor choppers were on display. The corridor that housed the show’s photography was a busy throughway between two of the main parts of the park. The varying photographic style showcased a wide range of approaches to documenting motorcycle culture. The lounge area held the display wall and table for the invited tank artists. 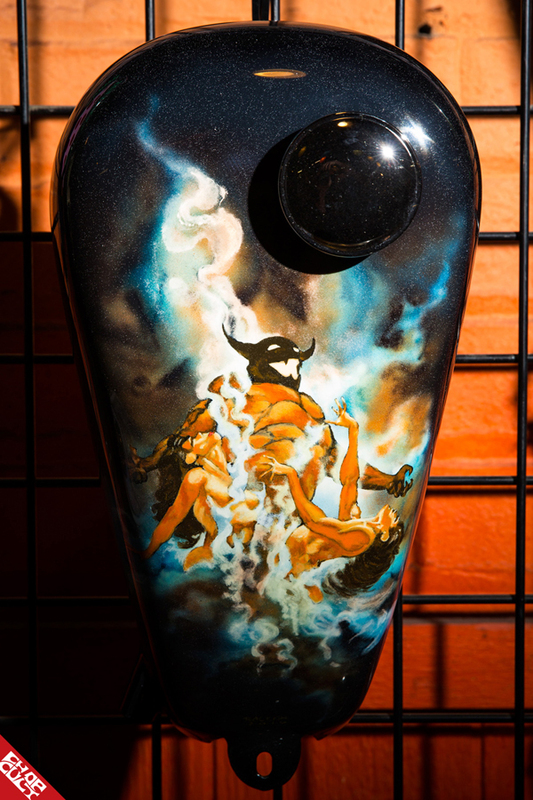 The artists were given Lowbrow Customs peanut tanks to do with as they pleased. These ranged from traditionally styled paint jobs to painted portraits, to engraved tanks; one of my favorite parts of the show. As the E-Z UPs started coming down, and the crowd started thinning out, the plans shifted toward the Show Class after-party. Before I made my way there, I took two of my fellow photographer friends, Jonathan Griffith, and Staci Wilt, back to Melt. Over some grilled cheese and beer, we reflected on the awesome show and what the rest of our summers had in store. At the after-party, bikes and revelers swarmed the bar. Many thanks were made by Mikey Arnold and then by Tim, of Show Class. Unfortunately, I took off before someone apparently did a burnout inside the bar for last call. Photo-op missed!